Welcome to our Dog Shop. Here you’ll find gear to deck out your four-legged best friends in our awesome collars and leashes. Our amazing rescue dog Nellie loves hers and we think your dogs will too! If you need help with anything drop us a line at skinnylegs91@gmail.com. Check out our awesome new logo dog collars. Features a repeating pattern of our logo and a hamburger. Available on light blue material with Black cord or Red cord on the inside. Available in Small, Medium, Large & X-Large. 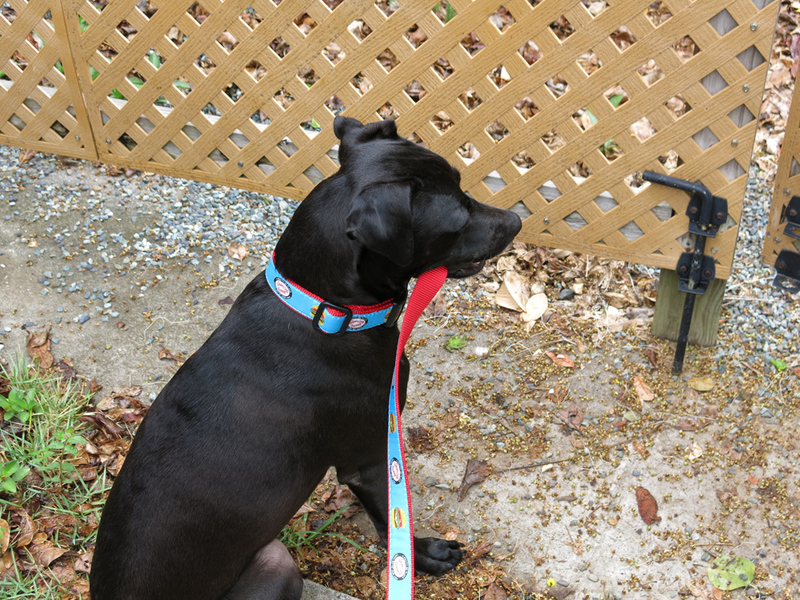 Collars are adjustable and match great with our new leashes (see below). What every dapper dog needs is his or her own Skinny Legs leash. Features a repeating pattern of our oval logo and a hamburger on a light blue background. Available with either Red cord or Black cord on the inside. All leashes are 6 feet long and match our adorable collars (see above). They’re super cute and are made of really high quality material!